I’ve been bullish on Channels since it was first launched in late 2015 as the Streaming Partners Program. Prime members are able to easily subscribe to dozens of different SVOD services, whose content instantly becomes available in the Prime Video app. Because Amazon already has members’ credit card info, there is zero friction in the transaction. SVOD services in Channels typically offer 7-day or longer trial periods and no contracts, so users can rotate in and out at will. 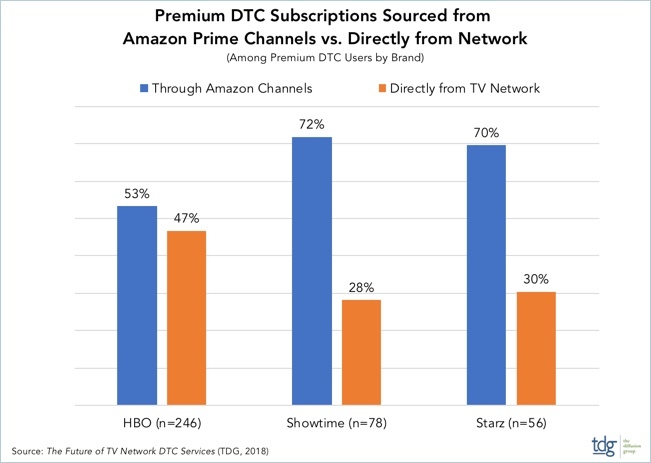 One of the reasons Amazon is able to drive huge numbers for SVOD is that it can promote services to select audiences within its 100 million Prime membership base based on prior purchasing behavior. Amazon keeps a share of ongoing subscription revenue from third parties. While others like Hulu have taken small steps to offer additional video services like Showtime and HBO, Amazon is far and away the leading aggregator of third-party SVOD options. That could change later this year if Apple decides to broaden its TV app as was reported last week by Bloomberg. With hundreds of millions of iOS devices and iTunes and Apple Music subscribers, Apple is perfectly positioned to also offer one-click subscriptions to various SVOD services. Though it would be coming to market very late relative to Channels, it could still become a formidable player. In the meantime, Channels will continue to dominate this space. Amazon’s success with Channels also opens the door for it to launch a complementary, very inexpensive skinny bundle, thereby neatly aggregating linear TV with on-demand services in one app. The TDG data is included as part of its report, “The Future of Direct-to-Consumer Video Services - Analysis & Forecasts, 2018-2022” which is available for purchase. TDG is also launching a new deep-dive, consumer study on DTC subscribers.